Quiche was one of the first things I learned how to make on my own. It was like nothing my family had ever made, and I only knew about it through seeing it on cooking shows and hearing friends talk about it. At first I was so intimidated by it. The word quiche, it sounds so fancy, like something an average person would have alot of trouble making. The very first time I tried quiche at a brunch with my friends at a restaurant downtown. It was by far the best thing I had ever put in my mouth. It was incredible how something so simple could be so good. And on top of that it was a breakfast, brunch, lunch and dinner item! Win! It didn’t take long to figure it out how to make quiche. You can make it super rich with heavy cream, or make it low fat with skim milk. I just used the simple ratio of 1 cup milk to two eggs. You can add any type of vegetables, meats or herbs you want. I began to make quiches several times a week, making them as a way to clean out the fridge. For this quiche though, I wanted to make something that appealed more to my son, instead of the veggie filled craziness that I usually do. 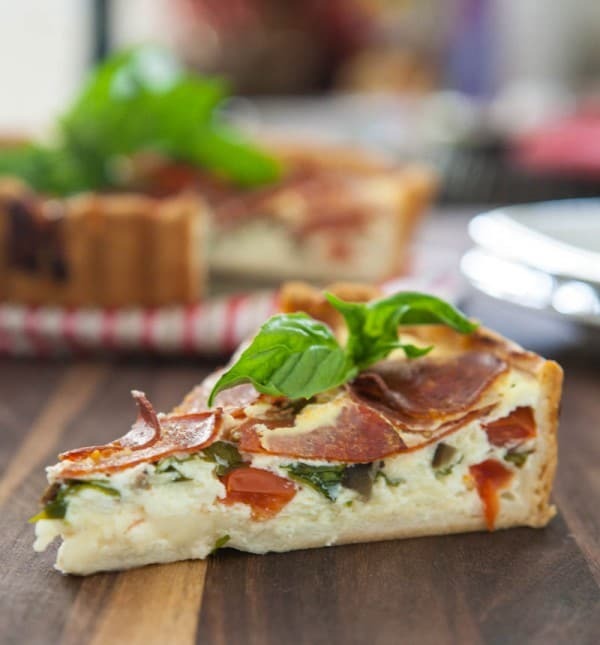 This quiche is pretty simple, just some chopped tomatoes, black olives and lots of fresh basil and mozzarella. I then top the quiche with lots of peperoni before baking it. To save on fat and calories, I used turkey peperoni. If you’re concerned about your eggs be sure to use Davidson’s Safest Choice pasteurized eggs. “Davidson’s Safest Choice® Eggs are pasteurized in an all-natural, gentle water bath pasteurization process to eliminate the risk of Salmonella. The vast majority of eggs sold in grocery stores are NOT pasteurized. Safest Choice™ offers peace of mind when making recipes calling for raw or undercooked eggs, and removes the worry of cross contamination. Learn more about Safest Choice pasteurization process and find store locations. Heat oven to 350° Roll out pie crust in deep dish pie plate or deep dish torte pan. Combine eggs, milk, salt and pepper in a large bowl. Whisk well to combine. Add chopped basil, black olives, tomato and shredded cheese. Mix well and pour into prepared pie crust. Top with peperoni. Bake quiche at 350° for 60 minutes, or until center is set. Serve quiche with fresh salad. 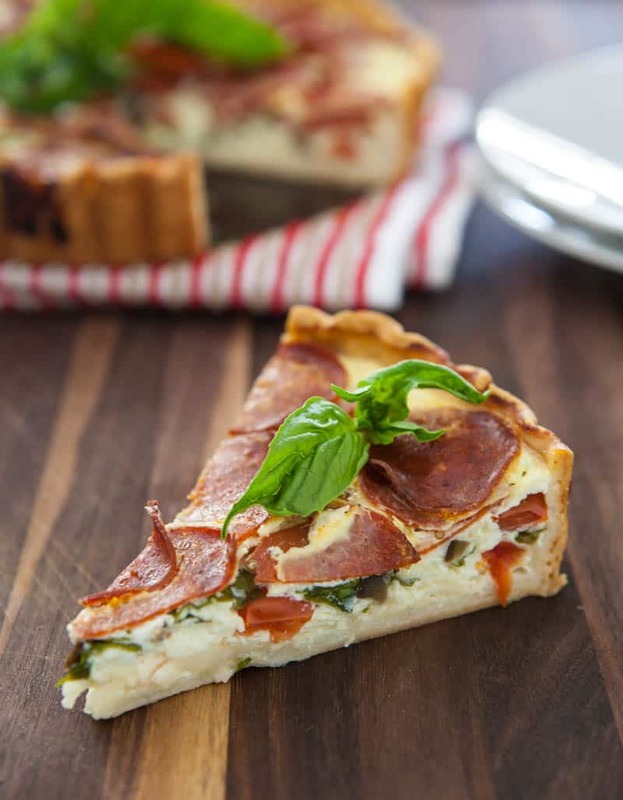 Never in a million years would I have thought to do a pepperoni pizza quiche. SO brilliant! We both have pizza on the mind today. Looks fabulous, Angie! 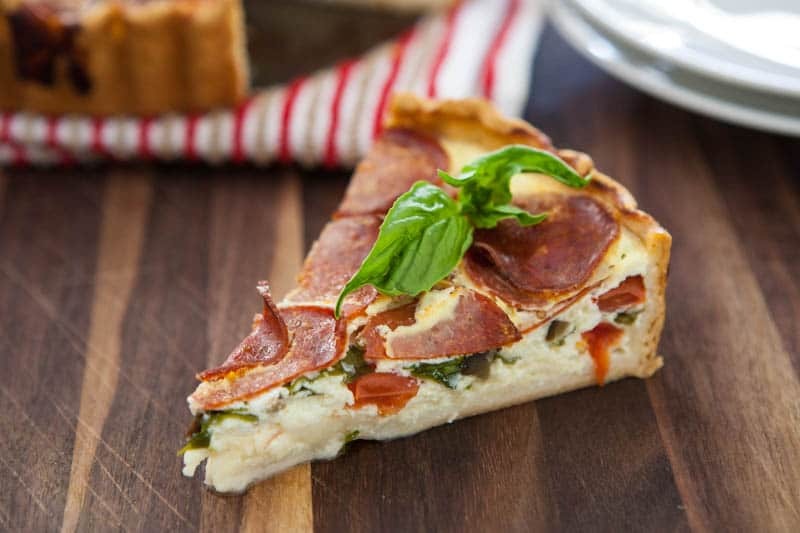 What a great idea for a quiche! This sounds amazing! Can you say fun? I love quiche and don’t make it enough! This is an awesome version. What a fun quiche, love it!